Take a minute to read this FANTASTIC story!! JANJAY DYEGA a 29 yr. old young refugee was someone I met in the Buduburam Refugee Camp in Ghana, in 2008. He was having pain, from a hernia, and needed surgery immediately. Provision of Hope provided the funds for that, and helped him to a nursing school in Ghana, after his Gr. 12 graduation. The camp was going through alot of unrest, and the nursing school was closed down. It was at this time that Janjay voiced his desire to go home to Liberia. “How would I get home? I have no money. I am not registered with the UN, and where would I go? I have no idea if my parents are dead or alive!” He had no contact with his parents since fleeing from Liberia, during the war. He assumed they were all killed. Janjay’s parents thought the same about him. United with family after years of separation during the war! Janjay, his father Otis, and Karen Barkman in January 2009. Janjay gave us the names of his parents, sibblings, school he attended, and the name of their local church in Buchanan. In no time we found his parents. They were both alive!! I knew from Janjay that his dad Otis, was a nurse, and assisted a pharmacist before the wars. His dream was to run a pharmacy, if he had the funds. In a small way he was attempting to do just that. 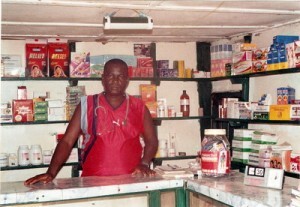 This is Otis Dyega in his pharmacy located 45 kms from Buchanan in Liberia, West Africa. With his profits he raises the orphaned children who live with his family. Otis is a man with integrity, who helps the poor in Buchanan. In 2008, Provision of Hope, first loaned him 650.00 USD. He was the first Liberian to pay me back 2 months ahead of schedule. I SAW HIS HEART, TO HELP THE POOR! I was amazed at what he had already accomplished on such a small loan. With my right hand, I received his first payment of 300.00 . I thanked him and honored him for early delivery. AT THAT MOMENT I was so overcome with GOD’S HEART FOR THE POOR, I could not help myself…I took the money, put it behind my back, then I said, “Otis I want to give you a gift! You have the very heart, I want to invest in” I took the money he had just given me, and told him to take it, and give it to the many who come to his clinic, who cannot afford drugs for their sick children. “GIVE IT TO THE SICK CHILDREN!” Otis has a dream to expand his pharmacy and clinic. Right now it is very small. He is qualified to go to the next level for a loan. Otis Dyega has a home full of orphaned children. These are the kinds of people we come along to assist. Those who have a heart to help children at risk and are already doing something about it, are the people we partner with. We are looking for people who would donate towards this cause. With our Micro Loans we help people to help themselves and fulfil the vision God has put on their hearts to accomplish. If you can help with this vision, by donating towards this micro loan, or that of another, we would appreciate hearing from you. If everyone did one small thing, together we can CHANGE THE WORLD!! BE A WORLD CHANGER AND START TODAY… that is how I got started… I reached out to one… YOU CAN TOO!! You are welcome to call me, Karen at 250-454-9456 or email me at provisionofhope@yahoo.ca for more information, or how to get started MAKING A DIFFERENCE IN LIBERIA. Please request photos of Otis’ orphaned children. They could use help with school fees this coming September. Otis and Marthaline his wife have 13 children that live with them. Janjay their oldest son is hoping to go to nursing school and come back to Buchanan to help his dad. If you can contribute towards this family please contact us.